Before dinosaurs walked the Earth, there was a meat-loving beast called Dimetrodon, which researchers just determined had the first known serrated "steak knife" teeth. Based on the new study, published in Nature Communications, we know that Dimetrodon was not afraid to bite off more than it could chew. 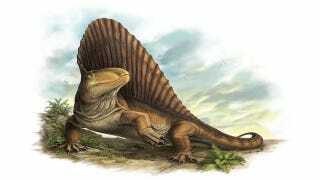 Its sharp, serrated teeth allowed Dimetrodon to rip into prey much larger than itself. Not surprisingly, this ravenous carnivore was at the top of the terrestrial food chain during its existence in the Early Permian Period. "The steak knife configuration of these teeth and the architecture of the skull suggest Dimetrodonwas able to grab and rip and dismember large prey," co-author Robert Reisz, a University of Toronto Mississauga biologist, said in a press release. "Teeth tell us a lot more about the ecology of animals than just looking at the skeleton," he continued. "We already know from fossil evidence which animals existed at that time but now, with this type of research, we are starting to piece together how the members of these communities interacted." Based on other known animals living at the time of Dimetrodon's existence, the toothy predator probably hunted prey such as large fish, aquatic amphibians, and certain land animals, including reptiles. It might have also snacked on insects that were around then. Reisz and graduate student Kirstin Brink, who led the study, used high tech equipment, such as a scanning electron microscope (SEM), to get an ultra close-up look at Dimetrodon's teeth. In addition to its ziphodont (a.k.a. steak knife) teeth, this carnivore also sported cusps — teeth with raised points on the crown — which are dominant in mammals. It's now thought that this over 13-foot-long very ancient animal was a forerunner to mammals. That's amazing to consider, given the reconstruction of Dimetrodon with its Spinosaurus-type "sail" on its back, turtle-looking head and more. A lot of people confuse Dimetrodon with dinosaurs, but successful predators lived long before dinosaurs even came into the world. As Reisz said, "Teeth fossils have attracted a lot of attention in dinosaurs, but much less is known about the animals that lived during this first chapter in terrestrial evolution…This research is an important step in reconstructing the structure of ancient complex communities." This article originally appeared at Discovery News and it is republished here with permission.